Today I’m sitting back and letting someone else do the talking! My dear darling S (whom I most definitely did not just call an overly mean name for running the dryer instead of the washing machine and then wondering aloud why the clothes hadn’t gotten wet…) spent his Christmas holiday in Maryland. He made a few jaunts up to D.C. for some friend-visiting, and one night he emailed me a couple of food photos with the caption, “I can’t wait to take you here!” Three weeks later, he’s still talking about the meal that inspired that email, and now he’s going to share his review of what’s probably his new favorite restaurant. So – here’s S! I chose to go vegan for entirely ethical reasons. That’s why you’ll find me wolfing down an entire slice of Chicago Diner cake while Kelly watches in awe, fork dangling from her fingers. 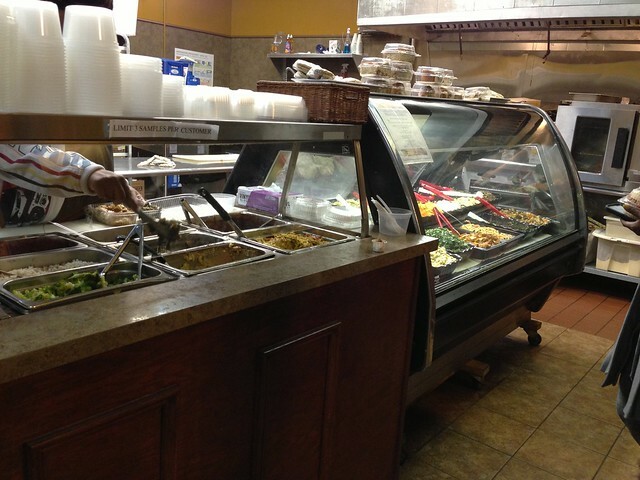 That’s also why I devoured a huge plate of food, plus half of my friend’s sandwich, on a recent trip to the vegan soul food restaurant Everlasting Life Cafe in Washington, D.C.
On the left you’ll see a hot bar serving an ever-changing array of entrees and sides. Choose from main courses like shepherd’s pie, barbecue tofu, or country fried chicken, and sides such as collard greens, macaroni and cheese, or black-eyed peas. On the right is a cold bar with a mind-bogglingly huge selection of fresh salads like marinated kale, seaweed, and mung bean. When I approached the counter, I had a momentary flash of fear–what if I’d misread the menu? What if this was the wrong place? But the server, perhaps a mind-reader, greeted me with a smile and a reassurance: “Everything here is 100% vegan.” What a statement! As a newbie vegan, precious few are the restaurants I’ve visited where everything is vegan. It’s so nice to be able to relax and choose based on what looks good instead of what looks like it doesn’t contain fish sauce. It was also great to be offered a barrage of samples in tiny paper cups; a sign declared only three were allowed per guest, but our server seemed to want us to sample the entire menu. After trying the macaroni and cheese, kale salad, and sweet potatoes, I wanted it all. 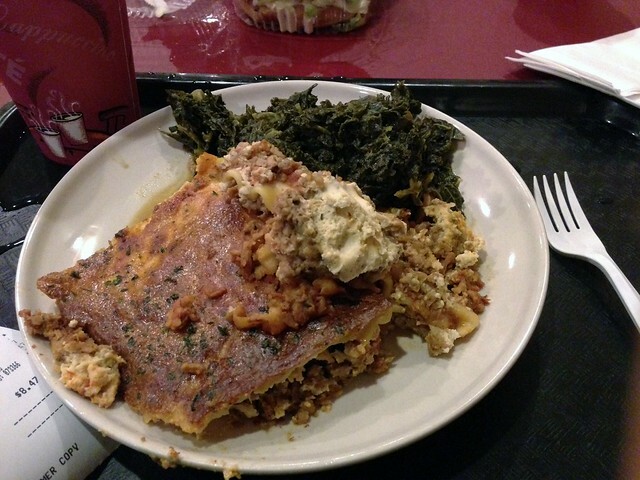 I settled, however, on the lasagna, with collard greens on the side. Lasagna as big as yo face. Wow! This meal blew my mind. The lasagna was packed with a great non-dairy ricotta, TVP-esque meaty bits, and plenty of delicious spinach. As you can see, the portion was huge, as was the helping of collard greens, which were deliciously savory with a strong smokiness. Despite the abundance of food, I didn’t have any trouble scarfing it down, and when my friend offered me the rest of her chicken sandwich, I accepted with very little prodding. Sorry I don’t have a picture, but it was a breaded seitan chunk slathered in vegan mayonnaise and topped with tomatoes and lettuce. In other words, exactly what a fried chicken sandwich should be! I cannot wait to return to D.C., hopefully with Kelly in tow, and pay another visit to Everlasting Life. It’s not fine dining–you grab your own silverware–and you should steer clear if you’re watching your weight. As Wikipedia notes, soul foods “tend to be very high in starch, fat, sodium, cholesterol, and calories.” But if you’re looking for a hearty, indulgent vegan meal, look no further than Everlasting Life. Yeah, I can’t wait to try it!